Everyone at DC Comics and Warner Brothers Pictures is excited about Wonder Woman. Not just because the box office numbers are great, but rather because Wonder Woman is a superhero with a storied history going back to 1941 – and the lead actress, Gal Gadot, throughout the film exhibits a bright, open smile that conveys hope and optimism for the future of humanity. I, along with the rest of SAP, are super-excited that at our annual SAPPHIRENOW conference a few weeks back we tapped into SAP’s long history of innovation and provided new optimism for developers and enterprises alike with the General Availability of SAP Cloud Platform that utilizes Cloud Foundry as the basis for our multi-cloud platform as a service solution for our customers’ digital transformation initiatives. This week we have another exciting event with developer superheroes — the Cloud Foundry Summit Silicon Valley in Santa Clara (Jun 13 – 15, 2017), a great opportunity for having passionate, detailed conversations with the Cloud Foundry community. I am looking forward to meeting the developer community there. So, what are we planning for the CF Summit? 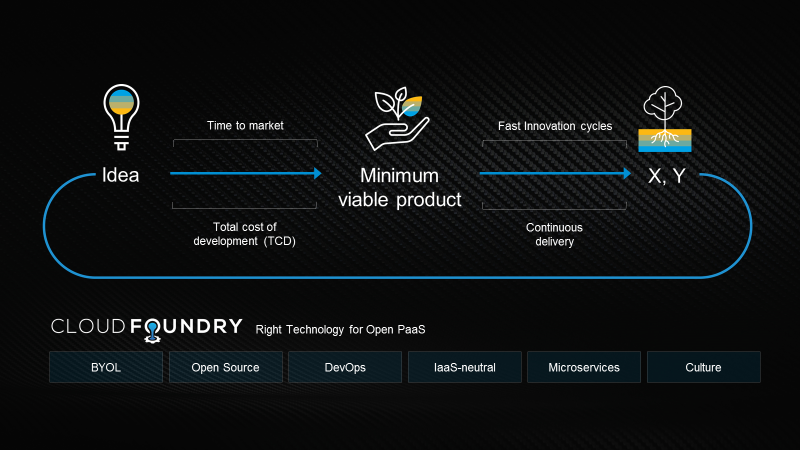 Let me start with the big picture about the importance of Cloud Foundry for SAP. Much ink has been spilled to describe how cloud-native companies like Uber, Airbnb and Facebook have conquered their brick-and-mortar counterparts in an historically short time span. This is the new reality and no industry is protected from being disrupted in a similar fashion. In fact, it feels like we are at the cusp of a new era where continuous innovation is the new norm for every enterprise. For example, the transportation industry revolutionized by Uber, per se, is already talking about new ideas such as aerial taxi, self-driving cars, custom delivery of goods, etc. The point is – complacency is not an option, even for the most innovative businesses. Hence, every company needs to re-imagine their business model in order stay relevant and competitive. Software is the main driver in this digital transformation, and consequently developers have a critically important role to play in today’s digital economy – they are the new superheros. This is why we chose to build SAP Cloud Platform based on open standards and open-source technologies: to make it easy for all developers to consume its rich set of technical capabilities and quickly build differentiating applications – while using their existing expertise and skill-sets. As business agility is the number one priority, developers are asked to do more in less time. So, enter Open Source, which lowers the entry barrier for developers and drives down the cost of development for our customers and partners. For these reasons, it made perfect sense to incorporate Cloud Foundry into SAP Cloud Platform. Cloud Foundry is designed ground up for supporting micro-services architecture and cloud-native DevOps, which are essential enablers of business agility. Likewise, the possibility to run Cloud Foundry on various infrastructure options (via cloud provider interfaces – CPI) and its broad support of various runtimes and programming models cater to the need for accelerated innovation and quick expansion of business solutions to new regions. Now let us quickly recap what SAP Cloud Platform is and where Cloud Foundry fits in. SAP Cloud Platform is not just a technology platform, but rather it is an enterprise PaaS, with a comprehensive set of technical capabilities and business services, including the most commonly needed technical services for enterprise applications such as Mobility, Analytics, Integration, Big Data, Collaboration, etc. 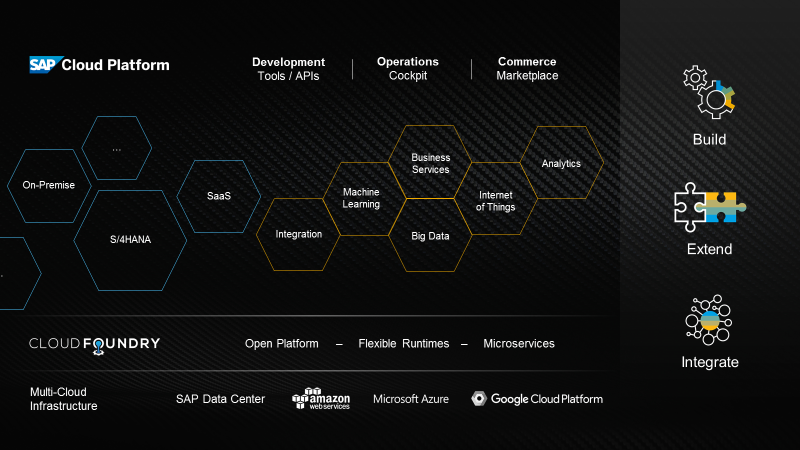 Most importantly though, SAP Cloud Platform also includes an array of innovative business services from SAP and SAP partners, wrapping ready-to-use functionalities in areas such as IoT, Machine Learning, eCommerce, all of which are published via SAP API Business Hub for easy discovery and consumption by the innovative applications. Any innovations, whether they are in the Machine Learning, IoT, Blockchain, or other emerging area, do not take place in isolation. There is hardly a customer who would have terabytes and petabytes of sensor data and not link that back to the products managed in the core systems. You need to link the intelligence from sensors to your manufacturing processes. You want to link the machinery failure out there in the field with your maintenance system, your support system and your service system. There is always an interlink between the innovations and the existing systems. SAP Cloud Platform provides you with all the modern tools and open technologies not just to innovate faster but also to contextualize the innovations within your core business processes, in a secure and integrated manner. As mentioned earlier, SAP Cloud Platform leverages Cloud Foundry as the open technology for application development as well as for multi-cloud deployment scenarios. The multi-cloud feature of SAP Cloud Platform (as announced at SAPPHIRENOW) is giving enterprises free choice of the underlying infrastructure provider: AWS, Azure (BETA) and Google Cloud Platform (coming soon). Now, you may ask – why should I be excited about multi-cloud? What does it really mean for me? regulatory and compliance reasons, etc. For partners – having a multi-cloud option for deployment means that they can now easily and effortlessly enter new regions and markets with their SAP Cloud Platform solutions. With the Cloud Foundry certified, multi-cloud SAP Cloud Platform, it has never been easier for partners to develop next-gen enterprise apps and bring them to a global marketplace of over 300,000 SAP customers. For developers, multi-cloud opens up an entirely new realm of possibilities to efficiently combine capabilities of SAP Cloud Platform with those of the public cloud they have chosen for deployment. In short: having a multi-cloud option is advantageous for all superhero constituencies of the Cloud Foundry community. As such, we are very excited to see SAP being the first major application vendor who has fully delivered on the multi-cloud promise of Cloud Foundry. And we are also very excited that Microsoft has now joined the Cloud Foundry family. 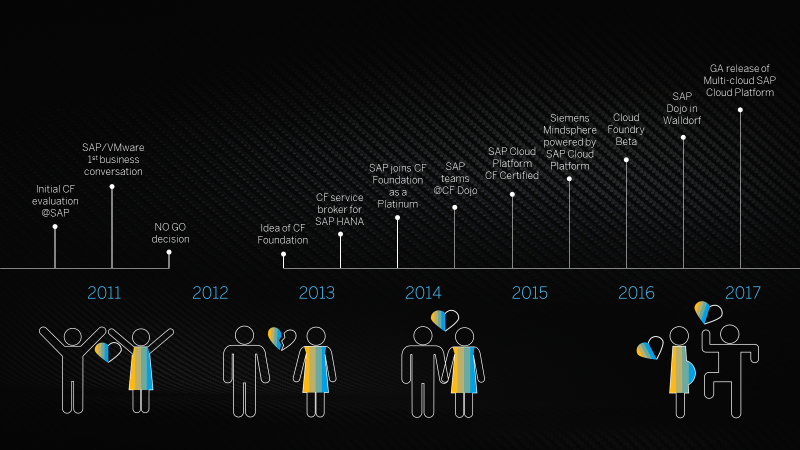 You may not know, but SAP’s relationship with Cloud Foundry dates back way before the creation of the CF Foundation (see below). As such, when we were approached to help bring the foundation to life, we joined the party from Day 0. We took the responsibility of being a Platinum Member of the Cloud Foundry Foundation and since then have been a consistent sponsor of several of the CF community events and programs. And SAP is doing our part to help Cloud Foundry advance by taking (co-) ownership of vital components and contributing to many projects. For example, bearing in mind our multi-cloud strategy SAP stepped up to lead the Cloud Foundry BOSH OpenStack CPI project. Soon after that, SAP opened the first major Cloud Foundry Dojo Lab outside of US in Walldorf, Germany. To provide benefits of standardization to our customers and partners, we ensured that SAP Cloud Platform is a Cloud Foundry Certified Platform. One of our major customer projects, Siemens Mindsphere – Siemen’s own industry cloud – is built on top of SAP Cloud Platform using Cloud Foundry. You can get a sense of our increasing engagement with Cloud Foundry from the above chart. As a good open source citizen, we have been giving back to the community the best we have to offer, which is — enterprise qualities. We have been contributing back most of the improvements we made to the Cloud Foundry codebase and kicked-off numerous new projects focusing on enterprise grade features. Today, we have several teams of engineers working as full-time-committers on CF open source projects. Open Source Service Broker API specification. In summary, SAP is fully committed to the Cloud Foundry technology and ecosystem. Businesses in all industries are currently going through massive digital transformation. Using enterprise PaaS solutions like SAP Cloud Platform along with its rich services and open interfaces, businesses are innovating faster to meet new demands, access new markets and drive new revenue. Cloud Foundry technology and community is a huge contributing factor to this industry-wide initiative. Collectively, we are shaping the right technological foundation for driving the innovations now and in the future. SAP is adding more and more business services and technical capabilities to the SAP Cloud Platform so that developers with Cloud Foundry skills under their belt can easily build cool enterprise applications which make a real difference for the businesses and subsequently for all of us. SAP is doing its part to help create a whole new generation of Wonder Women and Supermen, because SAP is equipping you to help make Enterprise the new black! To learn more about how SAP is using and contributing to CF, please make sure to attend the SAP talks at the CF Summit in Santa Clara . Of course, any amount of talk is not enough to give you a feel of the real stuff. So, make sure to try out the Cloud Foundry environment in SAP Cloud Platform on a public cloud of your choice today. It shouldn’t take your more than a few minutes to create a trial account and ‘cf push’ your app. This blog helped me in exploring our SAP comprehensive solutions for all business processes across all industries to find the solutions you need to run your business better, faster and simpler enterprise-wide. Thanks, Bjoern Goerke for the valuable information. I have seen a good blog on some of the sap partner website, I would like to share it. In the past SAP always choose the vendor lock-in option. So really great news for customers and partners!